This miniature superhero uses his superhuman strength to prop your favorite stories. After a full day of fighting crime, this miniature superhero has his priorities straight: Saving the stories! The little defender appears to have extraordinary strength, "pushing" a row of your favorite books upright. 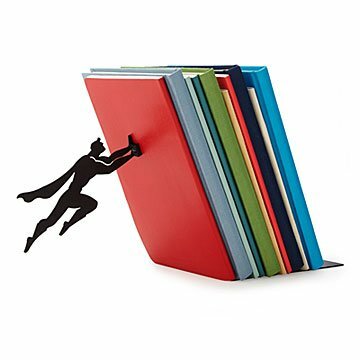 Place the cover of a paperback book around the traditional book end to disguise it, and the hero connects on the other side with superhuman strength (aka a magnet). It's a playful nod to every courageous protagonist, and makes a great gift for literary lovers whether teachers, writers, or just voracious readers. Designed by Ori Niv in Tel Aviv, Isreal. Made in China. My friend was ecstatic about the gift since they just finished building their new bookshelf. Anyone who love superheros and books, is going to find this gift special and thoughtful. I loved how this Bookend looked online and was excited to buy it. It doesn't work that well though. You can't put too many books, and I tried to use it in various ways but it just didn't work for me. I see in a picture in the reviews that it stays, but at home it didn't stay for me, and I couldn't put more than 3-4 books. I sent it back. Such a good idea, just wish it had worked. my husband collects comic books and superhero statuettes, etc. It was a great book end for the man cave with his displays. Excellent gift for your super hero fan! My brother-in-law is a huge fan of Batman and Superman so when I saw this gift, I knew it would be a hit - end it was! He's not easy to shop for, but he was very excited to receive this and it's really a great item. Will use ghe product in office as fun, conversation piece. I am giving this to one of my students for Christmas. While most people love Superman, it would be cool to see others, like the other classic: Batman. Unique gift for the Super heroes in the world. Well received by Birthday person. Surprised to see an item he's had never seen before. Nice price-looks well made. Small figure attaches by a magnet-Cute idea! Terrific gift~ well received by my Boss Unique! Small sturdy 1 sided bookend with "super hero" figure holding on by a magnet. Appears he is "flying". Not to be used for holding heavy books. So dog gone cute-who cares?